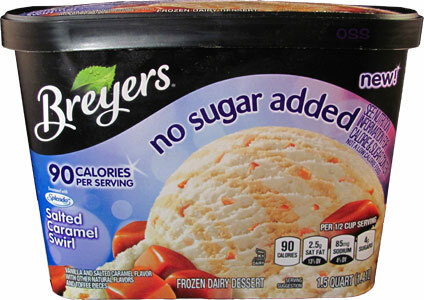 [By Nick, New for 2014] Well Breyers has finally done it. They have brought to life what might be one of the scariest hybrids in the ice cream aisle. The age of the No Sugar Added - Frozen Dairy Dessert is upon us folks! To say I was terrified when I first saw their Salted Caramel Swirl would be an understatement. I have a job to do though and there is toffee to be had, even if it is sugar free. These are the risks I take for you guys‎. Besides the whole thing being NSA and a FDD, the flavor doesn't sound all that bad. 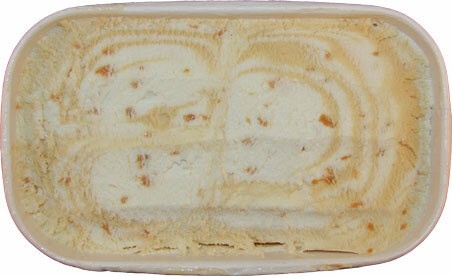 It’s essentially a swirl of vanilla and salted caramel bases with toffee mixed in with everything. I love toffee so how bad could this be? Removing the lid, not much is going on at all. There are a few pieces of toffee sticking out but I can’t see the salted caramel component at all. It does become more visible the more you go down though. Scooping some into a bowl, it seems to have a better consistency than their normal fdds. That holds true after I have my first taste. The fdd is denser than the normal ones Breyers offers and doesn't have much of the airy foaminess you get from the Blasts! line. ‎The flavor on the other hand is pretty mute. I'm able to taste the vanilla but the salted caramel base is really lacking. The same goes for the toffee. Not only are these pieces tiny with a few exceptions, other than the occasional texture change they really don't add much flavor either. You have to get a lot of them on your spoon to truly taste their flavor which isn't half bad to be honest. What you're basically getting with this flavor is an okay vanilla with slight hints of caramel and toffee notes every now and again. 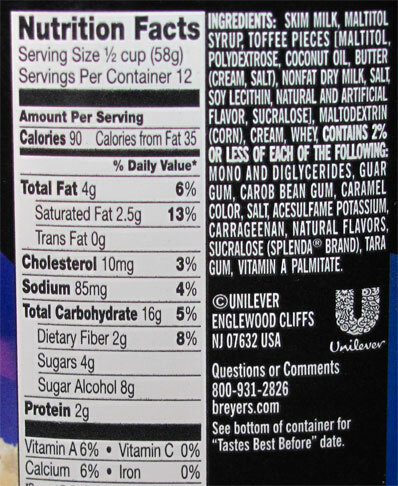 I didn’t notice anything in the way of sugar alcohols taste-wise or after-effect which is a plus. And while the texture isn't bad, I just couldn't recommend this to anyone who would be in the target market of this product based on the flavor. If I had to go nsa, I'd just buy Clemmy's Vanilla Bean ice cream and just add the appropriate toppings to get the flavor Breyers was aiming for. Great, now the NSA is in our freezer... I'm surprised the nutrition information wasn't redacted. Terrible Product. It was like eating a bowl of lard. It's not like the missing sugar was the issue. I have eaten other no sugar added ice cream products. This stuff has no flavor. Rite down the disposal. Who wants calories from a product like this.